Be part of the exclusive Athlone Fashion Trail and experience a day of runway shows hosted by local retailers showcasing the latest style from their autumn/winter collections. Athlone’s free inaugural Fashion Trail in association with Colm Quinn BMW takes place on Saturday, October 1. From daywear to dancing shoes, you will be treated to a unique style experience which is guaranteed to ignite your passion for fashion. Athlone’s leading retailers will be hosting free pop-up fashion shows throughout the day with a variety of on-trend style showcases and advice for a brand new seasonal wardrobe. From mother-of-the-bride inspiration to cosy winter warmers, you will get your fashion fix at the Athlone Fashion Trail. Some of Ireland’s most influential bloggers will be tweeting, snapping, and posting throughout the day to showcase Athlone as a leading shopping destination. Many retailers will be featuring the work of local designers including Helen Conneely in their shows, with dazzling window displays ensuring a truly unique fashion experience. The event will be as social as it will be eye-catching, with morning coffees, afternoon teas, and perhaps a glass of bubbly along the way. The leading ladies from Catwalk Modelling Agency will be in the capable hands of award-winning hair stylist Maeve O’Healy-Harte, with Aileen Duffy looking after make-up on the day. Retailers on the day will include Kadee Bride, Burgess, Olivia Danielle, Athlone Towncentre, Clodagh’s Boutique, and Nell’s Closet. 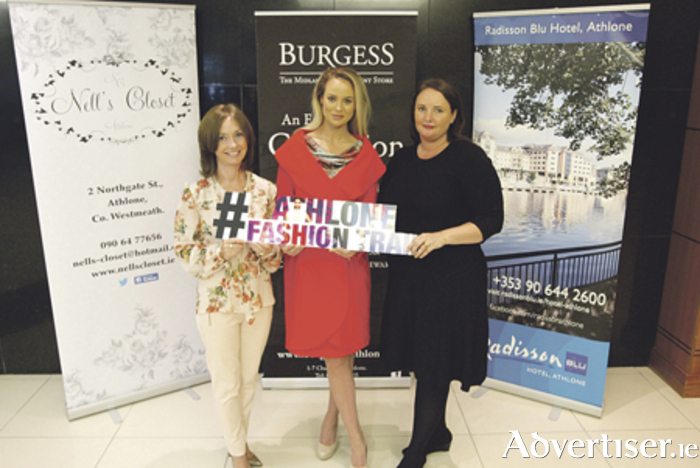 In association with Colm Quinn BMW, sponsors of the Athlone Fashion Trail include Radisson Blu Hotel Athlone, iRadio, Goldenegg Productions, and The Fatted Calf. Keep an eye on social media and local press for details of Fashion Trail times and further information. This is a free event so pop along on October 1 to join the Athlone Fashion Trail. Join Kadee Bride on Pearse Street at 11am and enjoy a unique and exciting day of fashion with friends and family. Sadness and grief — reality and joy!